1. What has God been doing in my home life (includes all in the home and close friends)? What message am I getting about it? Try beginning with: I believe God is. . . .
2. As I think about God’s message, what is my vision or goal for how I want life to be at home? 3. What am I doing right now to make this vision or goal a reality? 4. What do I still need to do? Begin with thinking of where you need to bring or to increase caring or love, fairness or justice; and working with your gifts, limitations, and convictions. 5. What specifically will I do or continue to do to make my vision or goal a reality and when will I do it? Limit yourself to just one action. This is or will be your mission in your home. 6. Who can work with me to carry out this mission? How will I describe the mission to interest him or her? Answer with the person’s name and words you might actually use. 7. When the time is right and with permission, how can I explain how what we are doing is or can be part of God’s mission? Answer with words you might actually use. 8. When the time is right and with permission, how could I encourage my teammate to turn to the church for help and support? Begin with how the church helps you; that may give you an idea of what to suggest for how it might help him or her. Answer with words you might actually use. Courtesy copies-get one copy of the book free with this form. e-books: When the Members are the Missionaries and Living the Gospel are available at the xlibris.com bookstore for $3.99 each. 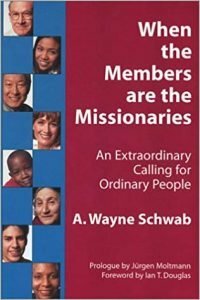 Amazon: When the Members are the Missionaries and Living the Gospel are listed by title. Books in PDF: For educational purposes only – Send your name, mailing address,email, and phone to membermission.org and specify which titles you need. Contact us and let us know how we may help you implement Member Mission in your congregation.